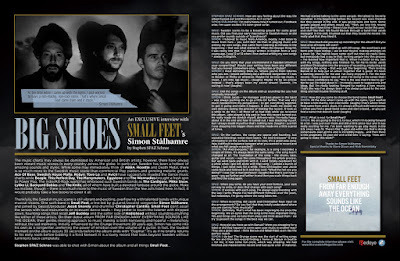 Discussions Magazine Music Blog: SMALL FEET: An EXCLUSIVE interview! SMALL FEET: An EXCLUSIVE interview! The music charts may always be dominated by American and British artists; however, there have always been vibrant music scenes in every country across the globe. In particular, Sweden has been a hotbed of amazing sounds and styles. While some may immediately think of ABBA, Roxette and Death Metal, there is so much more to the Swedish music scene than commercial Pop platters and grinding metallic grunts. Ace Of Base, Swedish House Mafia, Robyn, Tove Lo and Avicii have successfully invaded the Dance music charts while Beagle, This Perfect Day, The Merrymakers, Eggstone and The Wannadies brought a fresh spin to Power Pop. The Indie/Alt-Rock world has embraced such Swedish bands as The Cardigans, Miike Snow, Lykke Li, Backyard Babies and The Knife, all of whom have built a devoted fanbase around the globe. Make no mistake, though – there is so much more to the music of Sweden than the few acts listed here. In fact, it would probably take a few books to cover it all. Thankfully, the Swedish music scene is still vibrant and exciting, overflowing with talented bands with unique musical visions. 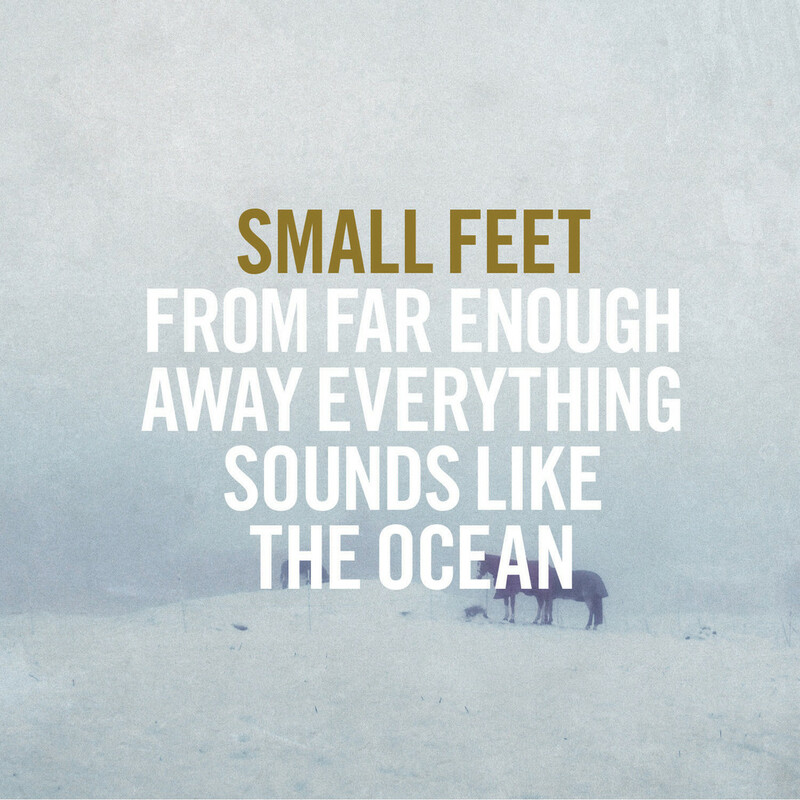 One such band is Small Feet, a trio led by guitarist/vocalist songwriter Simon Stålhamre, and joined by bassist/producer Jacob Snavely and drummer Christopher Cantillo. Small Feet don’t assail the senses with loud instruments or incessant dance beats – they prefer to touch the listener with stripped down, haunting arrangements that recall Jeff Buckley and the softer side of Radiohead without sounding anything like either of those artists. 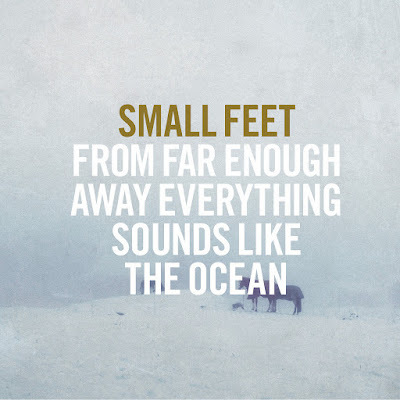 On their debut album From Far Enough Away Everything Sounds Like The Ocean, their gentle, moving approach to music making is both harrowing and hopeful – melancholy without the sad moments. Initially influenced by the Grunge movement 20 years ago, Simon has come into his own as a songwriter, preferring the power of emotion over the volume of a guitar. In fact, the loudest moment on the album occurs 30 seconds before the album ends with “Dagmar.” It’s as if he briefly returns to his early roots before bidding it a fond farewell. It is a lovely record that looks beyond Sweden without turning its back completely. STEPHEN SPAZ SCHNEE: How are you feeling about the way the album turned out and the reaction to it so far? SIMON STÅLHAMRE: I’m really happy how it turned out. Feedback wise, I’m super excited. It’s been great so far. SPAZ: Sweden seems to be a breeding ground for some great music. Did you find your early inspiration in Swedish music or did you prefer sounds outside of Scandinavia? SIMON: I listened to music from America, mostly. I did listen to music from here – you can’t NOT do that. In playing music and writing my own songs, that came from listening to Nirvana in the beginning – that was what started it. When the Grunge thing hit, I was really into that. I’ve always written in English from a very young age. I was 12 or 13 when I first started writing my own songs – always in English. SPAZ: Do you think that your environment in Sweden informed your songwriting? Would your writing have been any different had you moved somewhere else… like Boston or Dubai? SPAZ: Did the songs on the album end up sounding like you had originally intended? SIMON: I think Jacob – my manager and bass player in the band – was always pushing me to go a little bit further. That was very much needed from my perspective – to get everything together, to get it going and make it happen. It also made me doubt my own delivery during the process of making the record. It took us a while to do this – all three of us had kids while we recorded this album. Jake played a big part in how this record turned out. He really made me stretch myself, delivery-wise. I’m really happy about it in the end and how it turned out. I was doubting myself, but I always doubt myself so that’s nothing new. (laughs) I just felt I was stepping into bigger shoes and that made me a little scared at times. SPAZ: On the surface, the songs are sparse and haunting, but repeated listenings reveal more layers. “All And Everyone” is very atmospheric on the surface, but at its core, it’s a great pop song. Was it difficult to balance between what you wanted to record and what you felt people expected? SIMON: “All And Everyone,” for example, is a song I recorded a couple of times. It’s always been the same song – the song hasn’t changed at all. The foundation of the song – the drums, bass, guitar and vocals – was the same throughout the whole process, but we went back and forth with it. I went totally overboard for a while when I got left alone with that song – I added a bunch of things. I just went nuts for a while. Then Christopher and Jacob came back and listened to it and they said, “What the hell are you doing?” I was like a mad professor! (laughs) But that’s just how it goes – you go further and further in and then you scale things back and find the song again. SPAZ: When you write, do you have your own formula, your own set way to write, or does that change with each song? SIMON: It evolves with each song. I’m always experimenting with the way I write. Maybe I’ve had different formulas over the years, but nowadays, I’m going where the song takes me. SPAZ: When recording, did Jacob and Christopher have input on the arrangements? Do you feel that they totally understand where you are coming from, musically? SIMON: Definitely. That’s what has been inspiring to me since the beginning. We all agree that the song is the most important thing. We add things and we take them away and think about them - we try to present the songs in the best way we can. SPAZ: How did you hook up with Barsuk? Were you shopping for a label or did they happen to come upon your music in another way? They are a great label. I think Barsuk and Small Feet seem like the perfect match. SIMON: I do too! The Grunge scene was the start of writing songs for me and then this record finding a home at Barsuk in Seattle – for me, it had come full circle, which was amazing. We had finished and mastered the record and had quite a lot of material. We had started talking to the same people. We talked to Secretly Canadian in the beginning before the record was even finished but they passed in the end. It was going back and forth. Some people passed and others would say, “Yeah, we love this record but we don’t have time – there’s too much on our roster this year,” and stuff like that. We found Barsuk through a band that Jacob managed. In the end, it turned out that they loved the record. I’m really glad that they liked it. SPAZ: How much did you end up recording for the album? Did you have a lot of tracks left over? SIMON: We probably ended up with 20 songs. We went back and forth with track listings – we all had trouble making attempts on a track list. We had to leave some stuff out that we really liked, but everybody had a say in that. Inviting people into this process – I’ve learned how important that is. When I’ve been on my own with my songs, nothing was finished. So, for me to invite Jacob and then Christopher into the process of recording, producing and arranging the songs – that was just the beginning. Then inviting Barsuk in to help put an album together that is good. It’s been a learning process for me and I’ve really enjoyed it. For the next record, I have a better idea of what I’m doing in the sense that I have more confidence to say, “This is the way that I’d like to go.” Not to say I’m rigid about it – I’m totally open to suggestions and ideas. But I’m really looking forward to making a new record. That’s the way I’ve always been – I’ve always jumped to the next thing and had trouble finishing stuff. SPAZ: How did you come to choose the band name Small Feet? SPAZ: What is next for Small Feet?